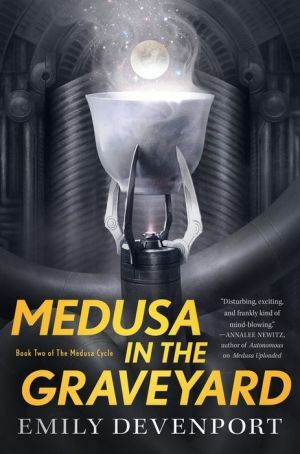 Medusa in the Graveyard is the action-packed, science fiction sequel to Emily Devenport's Medusa Uploaded. Oichi Angelis, former Worm, along with her fellow insurgents on the generation starship Olympia, head deeper into the Charon System for the planet called Graveyard. Ancient, sentient, alien starships wait for them—three colossi so powerful they remain aware even in self-imposed sleep. The race that made the Three are dead, but Oichi's people were engineered with this ancient DNA. A delegation from Olympia must journey to the heart of Graveyard and be judged by the Three. Before they're done, they will discover that weapons are the least of what the ships have to offer.